So you know those reports that say USC has reached out to Tony Dungy and (possibly) Jack Del Rio to replace Lane Kiffin? Yeah, well, those overtures never happened. Oh, someone claiming to be from USC did call Dungy and a member of the Denver Broncos coaching staff. 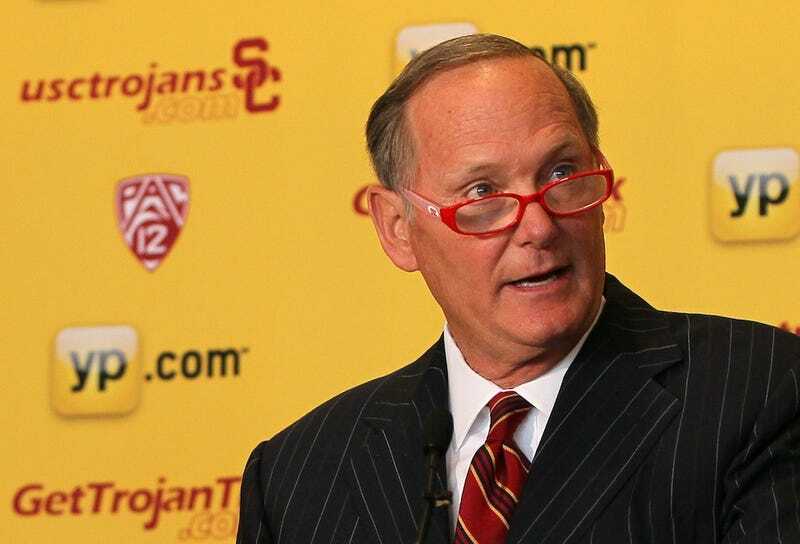 Whoever it was just wasn't actually someone with any real authority who works for USC. In one instance, a person falsely identifying himself as a high-ranking member of the USC athletic department attempted to make contact several times with the Denver Broncos' coaching staff to discuss the Trojan job. That person has been identified by USC and appropriate action is being taken. In another, someone claiming to represent USC reached out to a contact of former NFL head coach and current NBC broadcaster Tony Dungy, who said on today's Dan Patrick Show that he had no interest in the Trojan job. That person, again not a representative of USC, also has been identified and USC is in the process of contacting that individual. Anyone else wondering whether Kiffin's behind all this in some way?